Kays Kids: So Much is Happening this week. So Much is Happening this week. So much happened this week I must tell you all about it. Can you remember I went to Art class two weeks ago? Well, I met this new bear who is very distinguished, and he has a title. One of the art students that paints thing to look like nothing.... well it is supposed to look like abstract, and abstract looks like nothing. Does that make sense? This student brought along her bear to meet me and his name is Sir Edward. I have never met a sir before. We sat on the veranda and had a big chin wag. I listened and listened about how he became a Sir. I can't believe it, his Mum said he even looked like a Sir when he was born. Have you ever seen a baby that looked like a Sir?I was quite confused and then it made me wonder why my Granny didn't think I looked like a sir when I was born. I think I am stuck with just Wilbur. It was market again today, so early out of bed!!!! which I don't like. I know I am always trying on hats and I know what you are saying!!!! Pink again. Well I just want to show you what was on the top of this hat. Yep! you are right, a train. So it wasn't a sissy hat at all. Then I found these Bilby's. These are big Bilby's, because in real life Bilby's are quite small and at one time they thought they were distinct. (I'm not sure does that mean they smell) Stink means smelly, I'm not sure what distinct means. I found these doggy biscuits that say Peanut Butter Veggie Biscuits. Then they had All Sorts of wonderful flavors for Happy Hounds'. Is this discrimination against bears. If I ate one do you think I would start barking?? I'm not game to try. Then just as we were packing up I met a very different bear. He had a funny hat on and he was a Scottish bear. I know some one who might read this, would love Scottish bears. His name was Jock. What do you think he keeps under that big hat? I must show you lots of lovely Golly photos next week. 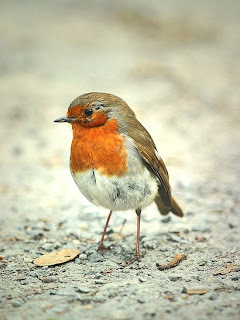 This little Robin red breast is for all my lovely readers. "Man may be able to fly like a bird. But he still can't sit on a barbed wire fence." Please don't ever think of yourself as "just Wilbur", you are WILBUR, the whole wide world knows you and everybear loves reading about your adventures. And you have your own Blog too. And, remember, this year at Camp Good Bear you are a Bearcelor, and that my friend is very important. So who needs to have the title "Sir" in front of his name? And another thing, you are and will always be MY HERO! Sounds like quite an adventure, Wilbur....hope you had sweet dreams....we're just waking to Sunday Morning here, so Happy St. Paddy's to you. BTW, I think you definitely need to complain about the lack of bear biccies there! We agree with Prudence. You don't need to be Sir anything because you are our dearest Wilbur and that is better than being a Sir. Guess what. Bellamine is going to be a Bearcelor at camp this summer too in the Arts & Crafts area. We just found out this morning and we're so excited! We can't wait to see the photos of Golly Day. See you next week. Prudence is so right about that... who wants to be a Sir when he is lucky enough to be THE ONE AND ONLY WILBUR... And no Sir could ever look that handsome as you wearing that hat! But we're a little shocked now, especially Fluby - what a shocking case of bear discrimination!!! We can only hope Granny comforted you with loads of peanut butter toast and even more honey! wow, meeting a Sir must be impressive. But in the end, he is just like you and me... I mean, more like you, with fur and paws. He is not better than you just because of his title. And I am pretty sure you are richer, richer in memories and adventures! Thank you for showing photos of the market! It must have been great fun! See, getting up early pays off! You met other bears and critters there! Now Wilbur, why would you want to be any one but your own sweet self? Having a title sounds very grand, but also a wee bit silly too. Although I'm sure your friend Edward is a beary nice fellow. Jock? My mom knew a Scotsman called Jock too. The market sounds like great fun, even if there was no peanut butter bear treats. Hello dear friend ... I read your whole story, interesting, like the pictures. Delicious ... and I also like the friends I look forward to your next post and interesting! Sounds like you had a great day out and you must have been happy chatting to a real Sir. The market looks like fun and I enjoyed seeing what you saw there. You are a sir too !!! our SIR !! My oh my you both have been very busy indeed. I so enjoy all of the amusements and will certainly pop in again to see what you've both been up to. We dub thee Wilbur the Wonderful, defender of teddy bear rights worldwide, and we girl bears are ready to show our support in your campaign for new bear biscuits by becoming your ladies in waiting (we're waiting for new peanut butter and honey biscuits). I'm really pleased you didn't eat any of those Doggy Biscuits .... A Barking Bear would not be nice .... especially when socialising with a Sir! Hi Wilbur, It must have been great meeting a Sir Edward. Edward must be his everyday name and Sir Edward for Sundays. I'm glad you met my Strine cousin Jock. He likes to wear his kilt and his bearskin hat - EEEEK did someone say b..b..b..b..b..bearskin? I do hope not. But he likes playing his bagpipes too - it's an octopus really but we haven't told him. Not just Wilbur! You are a very special Wilbur. Each of us are very special in our very own way. Our dogs would love those peanut butter doggy treats! I would be a little sad too if they didn't have bear treats. I'm glad you didn't take a chance with eating one. It would be very odd if you turned into a barking bear.